Invite contacts to your Habu team. Set booking notifications. Inviting contacts to join your team gives them access to your Habu admin account and the ability to edit and make changes. You can revoke access and set booking notifications per team member. 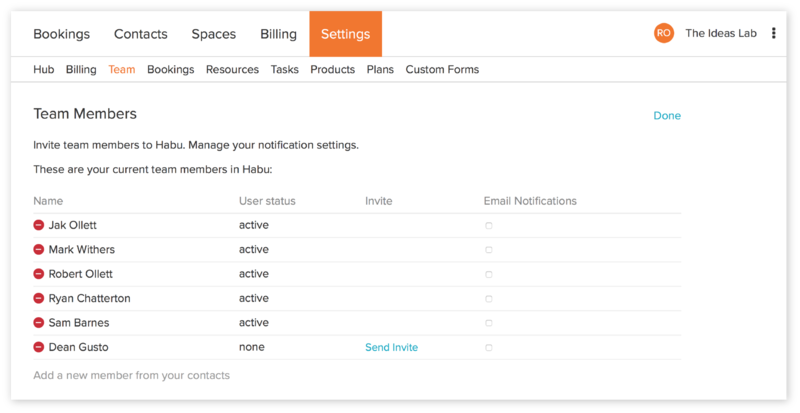 There aren't any restrictions on what team members can or can't do within Habu currently, so it's important that you only invite trusted contacts to join your team in Habu. Your Habu account will be full of sensitive information such as card details when your up and running. It's also important to keep your list up to date for this reason. To invite someone to become a team member in Habu they need to be a pre-existing contact in Habu, which you can do from the main contact page. To add a team member, select 'Edit' and click on 'Add a new member from your contacts' at the bottom of your list of team members. You'll be able to type, or select from the list, the contact you'd like to add. You can then select 'Send Invite' which will send them an invite via email to create a password. You can set who receives email notifications. Email notifications refer to new bookings either made or edited by members through the members app and bookings made or requested via a custom form. We will be enhancing notification settings soon. To remove a team member, select 'Edit' and then click on the red delete button. You can always re-add them if you've removed them by mistake.